What a lovely gown. Did she come wearing plaid originally? She has the hair I wanted. Yes, the Pretty in Plaid dolls all came wearing a plaid halter dress. Hers was green and yellow. I still have it somewhere but I loved her so much in the gold that it became her dress. The gold is lovely on her. Good choice. 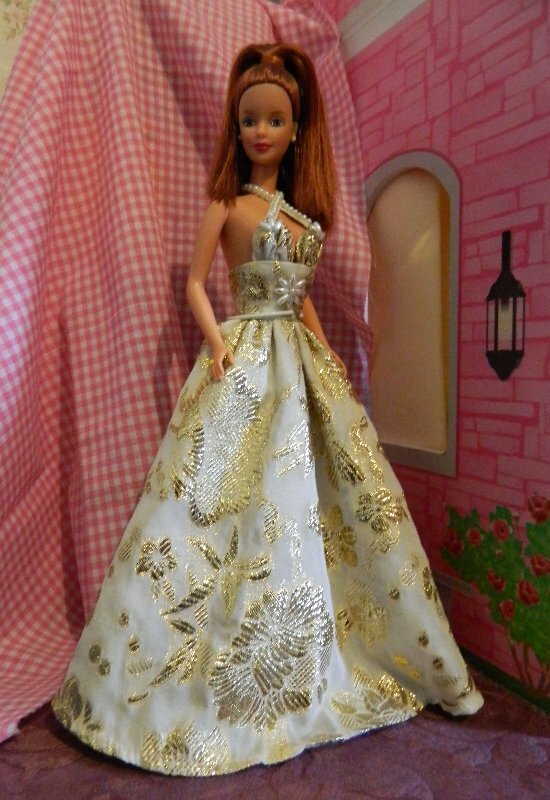 I have the Pretty in Plaid doll – somewhere – but she’s not wearing anything as exquisite as this gown – sooooo lovely! I bought this dress from an eBay seller a long, long time ago and I thought it would look good on her. They were nice dolls for playline. I have the brunette as well. Lovely dress! The top is really unique and sparkly. The doll is lovely, too. I like how her earrings match the dress. I used to have the name of the person who made this dress. If I find it again I’ll post it with this picture as she deserves to be complimented for it. I always loved this doll, but that dress is enhancing her beauty a lot. The seamstress really deserves credit.